May 6th! Surprise Giveaway and FREE eBook offer! GIVEAWAY SIGN UP MAY 6---MAY 10!!! 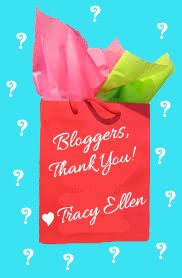 Hi, I'm Tracy Ellen, Indie Author, and you're invited to my Surprise! Giveaway! The giveaway begins Tuesday, May 6th, 2014 at noon CST and runs through May 10th! It is hosted by Book Enthusiast Promotions. The Surprise! Giveaway is my way of saying a huge, heartfelt THANK YOU! THANK YOU! THANK YOU! to all the readers and bloggers that have contributed to the success of my contemporary romance series, "The Adventures of Anabel Axelrod". Haven't read my books yet? Remember: May 6--10th sign up for your chance to win my surprise THANK YOU!! present in the red gift bag at one of the participating Book Blogs listed below. Any questions or comments? Shoot me a post! Otherwise, Good luck, my friends!